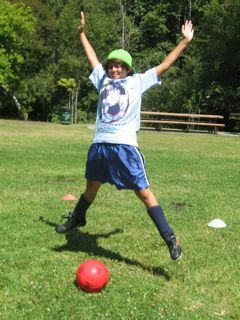 Campers arrive at 9 am daily and spend the first 15 minutes warming up during a supervised camp-wide recess. 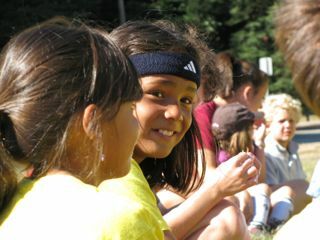 Campers are then called in to participate in the camp-wide morning warm-up, which includes a variety of fun, introductory, skill-building activities. Following morning warm-up, campers are dismissed into their designated groups. 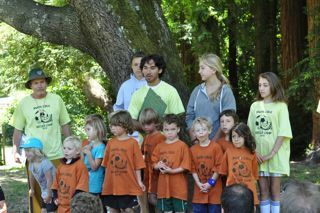 At 11 am campers come together to receive snack and enjoy exciting storytelling featuring the camp staff. After campers have had a chance to rest and eat their snack, they reunite for an all-camp game. Following the game, campers head back into their groups for the rest of the afternoon. Monday mornings feature an overview of camp rules and coach introductions. Campers are organized into their groups by age and skill level and head off for team building exercises and skill-drill-games. At the end of the day campers are led and dismissed to their parents or gaurdians following an all camp meeting and cheer. On Tuesday, campers will receive their camp T-shirts (before snack to help prevent food stains), and take an individual and group picture. Certificates featuring these photos will be handed out at the awards ceremony Friday. 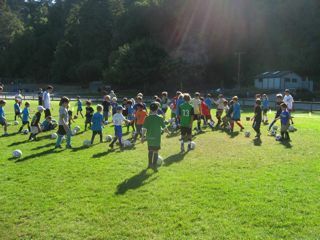 Throughout the day campers play several skill-drill-games as they acquire and hone their soccer skills. 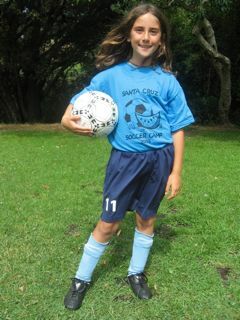 Wednesdays often feature camp favorites, Crazy Hair Day, Wacky Day, or even Animal Day! These special, themed days do not happen every week so please be sure to check with your camper or the coaches for details. Alternative activities within each goup may include hikes, creek walks, or sand soccer to give camper a mid-week break off the grassy field. On Thursdays, the oldest group of campers challenges the coaches to an epic battle to demonstrate the skills and teamwork they developed throughout the week. 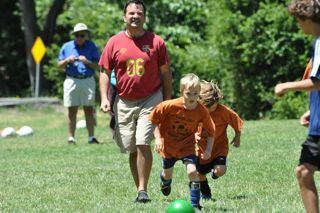 Often, coaches are outnumbered, yet still pull through with a win. At least most of the time... Meanwhile, the rest of the campers are led in energetic, creative, and positive cheers to give the oldest group a slight edge. Although they play an integral role in the victories of the oldest group, younger campers await the day when they, too, can play the coaches! On Friday, you (the parents, friends, cousins, neighbors, aunts, uncles, grandparents) are encouraged to join us at noon to scrimmage against the campers. There are generally two halves; the first featuring the youngest groups, followed by the older groups. This is a fun way for the campers to show you first hand the skills they learned throughout the week. After the Parent-Camper game we have a community potluck. We ask families to bring some sort of "finger-food" to share, while we provide the plates, hot dogs, and Gatorade. As parents and campers enjoy the delicious spread, our fantastic Coaches introduce themselves, recap the week, and distribute certificates to the campers. Following the ceremony, parents are encouraged to stick around to meet and talk with the Coaches and Directors.